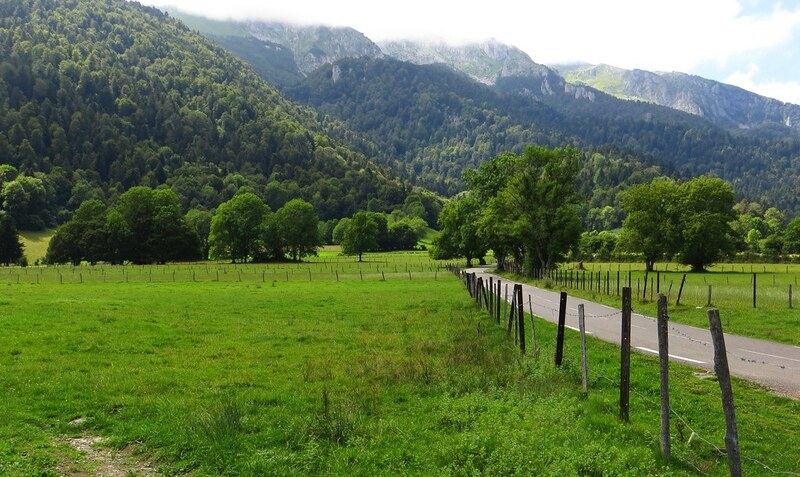 A scenic road borrowed many times by the Tour de France, the Col de Marie Blanque will often tempt many cyclists visiting the Pyrenees. But there’s a difference: it’s much steeper than your average Pyrenean pass, a fact that’s ruined the day for tourists and Tour riders alike. The Route: 16km kilometres south of Oleron St Marie the D294 starts in the village of Escot and heads east towards the col and then back down to Bielle. The road can be ridden in both directions but here is the western face, picked because of it’s unusually steep flanks. The Feel: the road proper starts in Escot and the signposts show the way. For once the metal signs are helpful because there’s little at first sight to suggest a mountain pass awaits, the small Barescou valley looks gentle with meadows sitting below soft flanks. There’s little traffic and a tourist sign declares you’re on the Route du Fromage, the “Cheese Route” which only adds to the soft lethargy, the confluence of lipid and limpid. The road rises a little but it’s all so gentle until you reach the sign for a campsite and suddenly the road kicks up. What was easy is now hard as the slope bites at 12-13% and stays that way for over three kilometres on a long wooded section with few curves. It’s steep but regular, get a rhythm going and hold. There are signs to indicate what’s happening but they’re almost not needed as you only need look up the road to see what’s coming. Look close at the road and you might spot scuff marks from worn plastic and metal cleats from those who were forced to walk up. The top is obvious, a hairpin signals the final ramp and then the road arrives on the Plateau de Benou. Many passes resemble a saddle on the back of a horse, you climb up one side and then roll down the other but this is different, there’s only a short descent before you cross the plateau, a calm area with wide flat roads and meadows bordered by trees, if it wasn’t for the ridges you could be riding across Normandy. Pointless Pass: many famous mountain passes have been vital transport links and strategic military points, linking two large valleys together. But the Marie Blanque isn’t one. Just five kilometres north of the east-west axis is a parallel road that allows you to cut across for a lot less elevation. But all the better for cyclists as it means the Marie Blanque has less traffic. Tour de France: the race has passed 14 times. If the Pyrenees were the start of high altitude racing this one is a relative newcomer to the race with its first inclusion in 1978 and it wasn’t used again until 1986. Perhaps this was because it helped ruin Bernard Thévenet’s chances. The Frenchman had won the Tour in 1977 and was back the next year but ground to halt on this climb and needed a back wheel with a 24 sprocket. Gearing: don’t be a Bernard and come with the wrong gear. The correct gear cannot be recommended, no more than this blog can recommend shoe sizes. The Marie Blanque is not Monte Zoncolan but it’s significantly steeper than everything else within range. 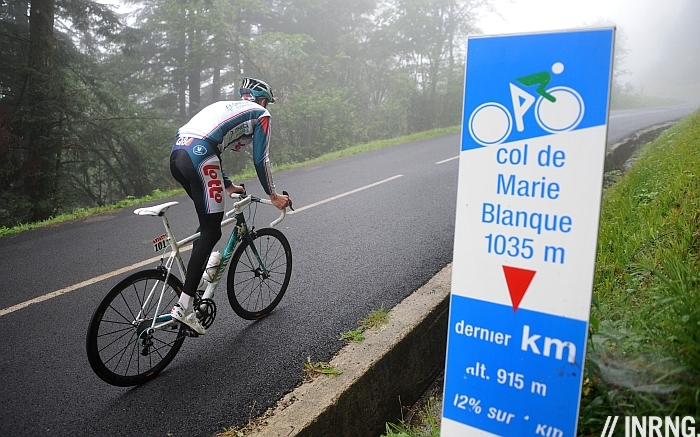 But whatever you take to the Pyrenees, take something extra for the Marie Blanque. Failing that, you have two choices, hit the climb hard and force your way to the top. The other is to start the day with some old socks and be prepared for a long walk. Name: there are vultures in the Pyrenees and this climb takes its name from the Egyptian vulture with its white plumes. Daniel Friebe’s Mountain Higher suggests it was named after a deranged women with pale skin. In both cases the blanque is derived from blanc or white. Travel and Access: Pau is the nearest city and a fine place although it’s a little from from the Pyrenees to work as a base for a week. But the Marie Blanque is within riding distance south of here. I remember this from the 2010 Etape de Tour. The approach was noisy as we went down a narrow road, guys shouting at others to get out of the way. On the climb there was total silence, only the clack of cycling shoes as hundreds of people walked up. I had a good start and made an effort early on in order to avoid the crowd on the way up Marie Blanc. Right after good climb I had my rear tire blow at 50kph on the way down (thanks to overinflation, my fault not checking it prior to start) and hit the ground hard. Thankfully only lost a bit of skin, another bit of my bibs and a good portion of my confidence. Still, after getting myself together I resumed the course for a beautiful, if hard, day on the Pyrenees. Finished in a little over 7hr, the Tourmalet was toooough but all 3 climbs that day were awesome and I would love to do it again someday. I absolutely LOVE the Pyrenees! Yes I remember that day.Too many riders and a narrow road was the problem uphill but the descent Is glorious.Would love to repeat that day. I will never understand the reluctance so many have about putting on a gear one can pedal up steep climbs like these. Granted, this one’s “only” 3 kms @ +10%, but with modern drivetrains and 10 or 11 cogs in the back and compact setups in front, it’s a no-brainer. In the 25+ years I’ve been in the bike tour biz, both in France and in the last 15 almost exclusively in Italy, I can’t count the number of times a client has wished he or she (it’s mostly the he’s) had mounted lower gears while NOBODY has ever told me they regretted fitting them. It’s often people thinking what they can get away with rather than thinking what’s appropriate or comfortable. Plus many have yet to experience a climb that lasts for 20, 30 or even 90 minutes, the effort is very different. I think it’s simple! the gearing and climbing thing is human nature. The same reason that plastics surgeons make so much money on elective surgery, vanity! We tend to believe that age is not something that we need to be concerned with. I think there is also a lot of macho ‘tough guy’ attitude around gearing. Just look at how triple chainrings are looked down upon, or hwo climbs are said to be easy by stating ‘you can do this in the big ring’. Anyone who knows more or less what speed they can maintain on a flat road for a while can go to the internet (e.g. http://www.kreuzotter.de/english/espeed.htm) and calculate what power output they approximately have, and what speed that would correspond to on a 13% slope. After they’ve recovered from the shock (that low? ), they can then go to other sites (my favourite: http://ritzelrechner.de ) and calculate what gear they need for that. Just to give you an example, I weigh 77 kgs and to get up 13% with 9 km/h I need 300 Watts. That’s quite a lot to me if it comes after a few hours already in the saddle. Even to maintain a cadence of 60 I would need a 1:1 gear. But many just think a 28 cog is really big and they will get away with that. Or they look at what the pros use and think that this must be good for them too. Even the pros get it wrong sometimes, look at Tirreno Adriatico last year where some had to get off and walk. Even if I can hold 300watts for 60minutes (72kg rider) I prefer to maintain reasonable cadence and I dont like to go full gas if not racing. It is crazy… even when you say to some riders that even “Alberto” sometimes runs a 32 / 34 T on the back (ok, that may be on the Zoncalan, but…), they still can’t move away from thinking that all they need is a 54/39 with 11/25, no matter the steepness / length of ride etc. Yes a rider 20kg’s lighter than me (I’m 90kg+), may not need as easier gearing as me to get up the steep hills, but by the same token I can put much more power out than them on the flats / descents, and I still don’t need anything bigger than a 50 / 12 combination for all bar a few special roads. And well before I’m even in that gear those other riders are being dropped off my wheel. Interestingly, I’m seeing a lot of women riders lately not having compacts fitted. I would have figured they were more likely to have one fitted as opposed to not. “you’re on the Route du Fromage, the Cheese Route which only adds to the soft lethargy, the confluence of lipid and limpid” Brilliant line but now I must ask what cheese comes from this region? Between the “lipid / limpid” line and the one from yesterday about the stars that are not present at the Etoile de Besseges, you are on a roll! I climbed the Marie Blanque as part of the Quebrantahuesos in 2010 but never saw the climb due to the freezing cold torrential rains we had all day. I do know the climb was the only time during the day I warmed up and descending the hairpin turns to Bielle was scarier than hell! Thanks for the pictures. Now I know what I missed! You are correct Dominic. However some were quite abusive trying to force their way through. I must admit it was frustrating as I had a triple that day and was reasonably confortable even at 12%. Yet I just took it as one of those things and soaked up the rest period, such as it was. 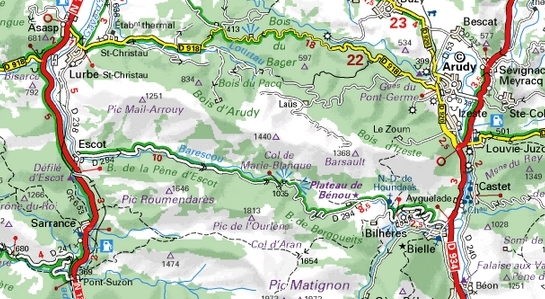 I expect to see lots of riders walking on the Hautacam this year ……. there are some nasty sections and if you have not got the right gears and you are overweight YOU WILL SUFFER! I’ll have to put this one on my list for the next Pyrennean adventure, whenever that might be! This climb surprised me, the noise is a strong sign of what’s ahead as you approach it through the valley, just normal running water initially, to a deafening torrent next to you, then bang, you’re on this very steep hill. Probably rate it as harder than the ‘big’ climbs, due to it’s steepness & the fact you can’t really ever see the summit, there’s absolutely no respite. Climbed this one in the 2005 Etape. What I remembered most was the lack of hairpins. I always find it easier ton climbs with hairpins as you can mentally break the climb down into segments. A toughie for sure! I was in the same year as well. I followed the advice of Velo Magazine and saved my two easier gears for the final. Alas, as I was one of the late starters, I was constrained to walk the last kilo; the traffic jam was impassable, we just heard “bouchon” and have to climb off our bikes. As a way to break it into segments I used the signs on the side, the ones that inform you about the gradient of the next kilometre. Putting on enough gears for this climb could be expensive. New chain, derailer, cogset, crank… And doing all that reduces functionality on more normal terrain. Delivering papers is much cheaper. I am with you on that Larry! Here in the Pyrenees a triple gives you confort, confidence and complete flexibility. Last year with our club, the Cigognes of Tarbes, we did Hendaye-Cerbere, a W/E traverse of the Pyrenees. Our route included over 30 cols including all the mythic giants like the Tourmalet and the Aubisque. My Shimano Ultegra triple was worth its weight in gold. Try Col de Burdincurucheta ……….. and feel the difference – cadence, efficiency and confort.